Areas of practice include corporate and individual financial crime, commercial fraud, anti-corruption and bribery. Zacharias a leading international and UK criminal lawyer. 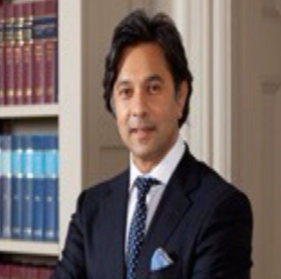 He is regularly instructed by high profile clients around the world and has been instructed in the UK in many of the leading cases involving criminal law and commercial fraud. He is known for having an incredible eye for detail, superb technical ability and litigation instinct. He is fearless however he is approachable with excellent interpersonal skills to bring the best out of his clients. He started practice at the bar as a commercial and criminal/ civil intellectual property lawyer and in his early years practiced in both civil and criminal law. Zacharias has developed a specialist area which sits at the junction of criminal law and commercial fraud. Having been in practice for over 25 years, he has acquired great experience in many areas of law and is now taking on national and international fraud/ bribery cases with multi-disciplinary teams. He has a wealth of experience in advising clients particularly in the early stages and in crisis, setting out their options and guiding their responses, whilst also making the preparations necessary for future litigation. Recent instructions include representing Vincent Tchenguiz in both the criminal SFO proceedings and in the commercial actions against the SFO for misfeasance and damages. Instructions included the commercial fraud actions arising in the complex commercial fraud case of Vincent Tchenguiz and Rawlinson & Hunter in claims in the BVI and London against Grant Thornton (UK) and Kaupthing bank (Iceland) for damages amounting to £2.2bn; acting on behalf of a family in relation to a worldwide £800m fraud against their trust; allegations against international clients of insider dealing and market manipulation in France; allegations of fraud/corruption by an international property company in a European investigation of £1.6bn; actions for misconduct by trustees; commercial actions for libor and banking fraud; blackmail, bribery and corruption. He works closely with global company heads and international family offices providing strategic solutions to complex litigation and leading multi-disciplinary and multi-jurisdictional teams. Directing and deploying effective strategies to deal with complex situations and cases.